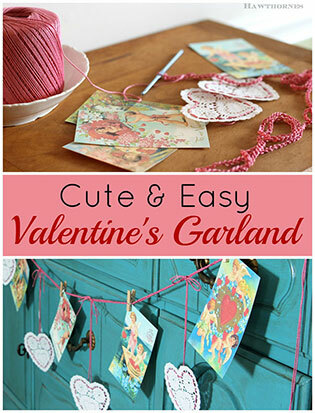 Do you remember making paper hearts in grade school? Sort of like when you cut out paper snowflakes with scissors, but this time in the shape of a heart? Those were the days. When a couple pieces of paper and a pair of scissors could occupy you for the whole afternoon. And for your classroom Valentine’s Day party you’d cover a shoe box in construction paper, glue on a few of those paper hearts and then sit back and wait for all the kids in your class to drop their Valentine’s in your “mailbox”. 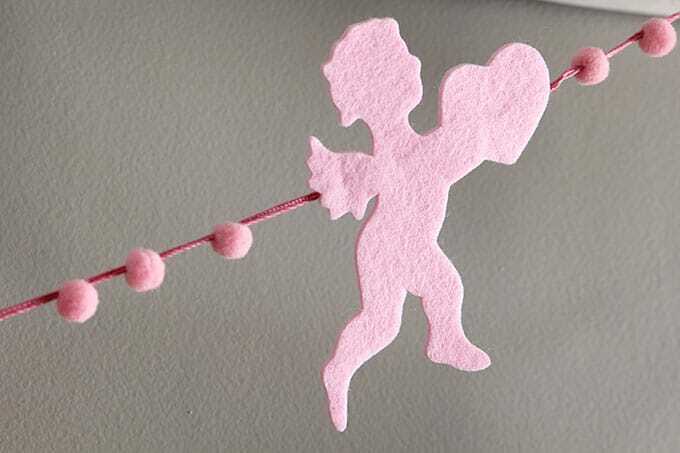 In our school you had to bring Valentine’s for every single kid in class (whether they ate boogers or not), so that meant you were assured of having a ton of Valentine’s by the end of the class party. Of course, you could read whatever you wanted to into the Valentines. 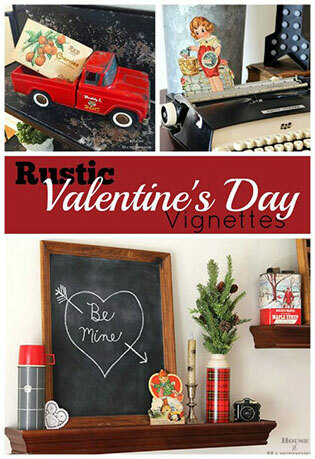 If it was from THE boy you had a crush on, then of course his Valentine with a bulldozer on it had a deeper meaning. Oh, he wants to scoop me up!!! He must LOVE me! 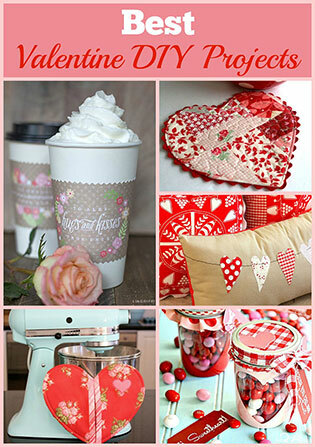 Except I used store-bought paper hearts instead of making my own. And there’s no Valentine’s Day mailbox. And no boogers. So yeah, just a nod to my elementary school days. Now, I’m not going to go into a full blown mind-numbing tutorial on it for you, because a) it’s not that complicated and b) it’s not that complicated, but I will give you a rundown on what I used. Add stickers to your paper heart doilies if you want to bling them up a bit, could also use glitter or leave as is. Thread your needle with crochet thread. 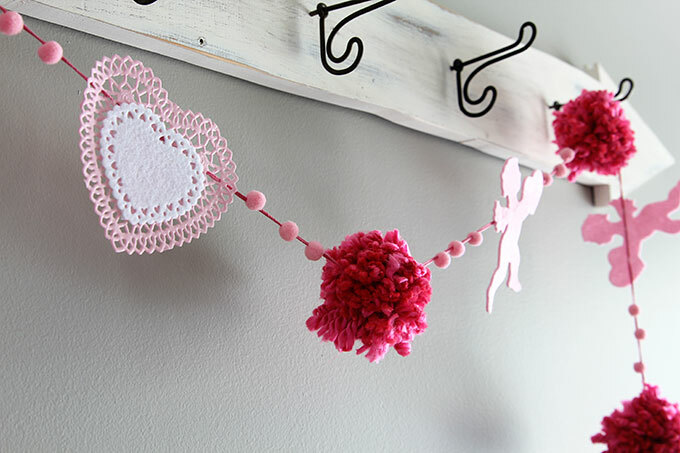 String your paper heart doilies, homemade yarn pom poms, mini pom poms and felt cupids/doodads onto your crochet thread. Space them out however you like. My garland is around four feet long. I had originally planned on hanging it on my blue dresser in the living room, but it was too long for that so I ended up throwing it cattywampus onto my coat hook in the hallway. And it wasn’t until I was writing this post that it occurred to me that the arrow coat hook sort of went with my Valentine’s Day theme. Cupid. Shooting people with arrows. Bam! It couldn’t have worked out better if I’d planned it! OK, and this is where I hang my head in crafting shame. I took all these photos and forgot to cut my string off at the end! It still has the needle attached! 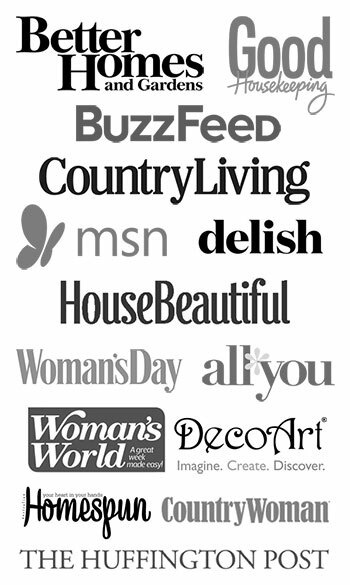 If you’re feeling like you want to pin something to your Pinterest boards today, go at it! Cupid will reward you! 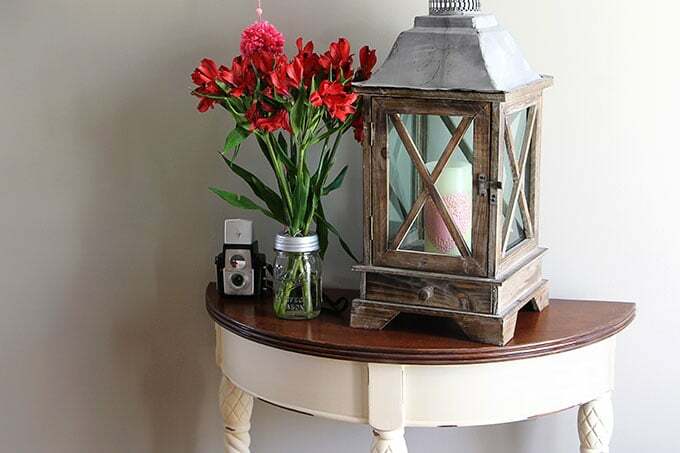 *If you need a good pom pom tutorial, Michelle at Dandelion Patina has a great one using the Clover Pom Pom Maker. This is SO charming, Pam! 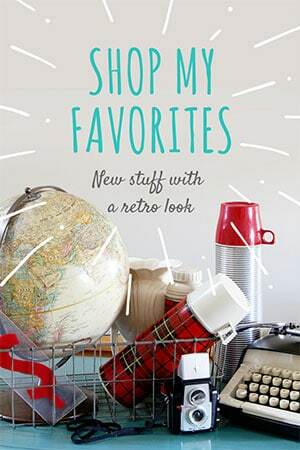 I love all of the cute goodies you brought together! And “hanging your head in crafting shame” cracked me up…still laughing. Oh my goodness, this brought back so many memories that I haven’t thought about forever. Of course tho, when I was in grade school, it was in the olden days, of 1946,47,48,and 1949. At that time we only bought and received valentines from the kids we liked and who liked us. I remember I thought that decorated box was the most beautiful thing in the world. I did receive lots of those valentines, and should have kept a few (grin), now that I see some of the old ones for sale at a indecent price. (I guess I wouldn’t sell them, if I had kept them. duh) Anyway…. we did have a boy in our class who ate boogers, and also chewed on the lead of his pencil…I don’t recall if he got valentines or not, but if not, it’s a pretty sad thing. Can’t imagine how that might make a little kid feel, and I’m glad things have changed in the right direction in this regard…Wishing you a VERY happy Valentines day from WI. Glad I could take you down memory lane 🙂 I remember there being a couple boys in my class who I really disliked and it was torture to have to write out a Valentine for them. I’m a better person for it though (I hope)! Maybe the needle will become a “thing” :)! You’ll see it at Pottery Barn next year! 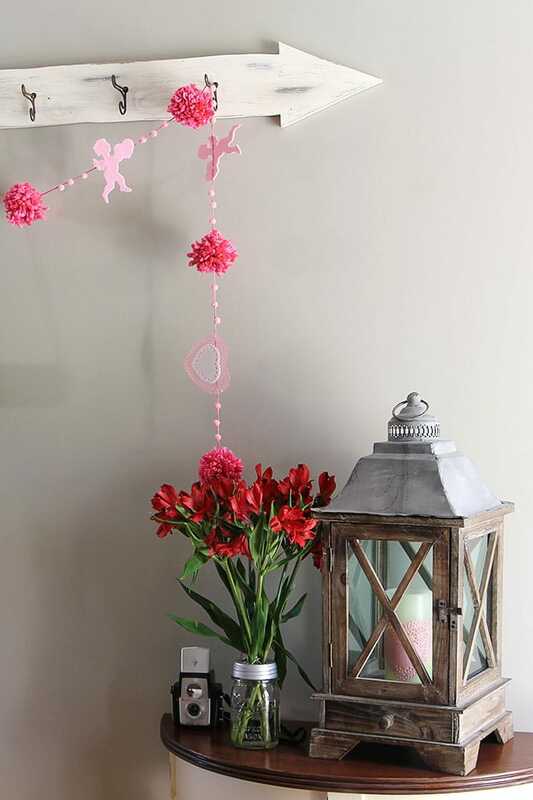 This is so cute & charming & delightful, I was instantly drawn the post looking at the picture of simplistic beauty , making any day special….those lacy hearts,the pompoms & the candle holder steal the show ! The needle IS THE classy signature piece. “If it was from THE boy you had a crush on, then of course his Valentine with a bulldozer on it had a deeper meaning. Oh, he wants to scoop me up!!! He must LOVE me! ” totally cracked me up ! I was glad to read you were told to bring a Valentine for everyone in the class. Our teacher never told us that..but my mom told me I was to give EVERYONE in my class a Valentine. That was and still is a great memory for me. I’m thankful for a mom who wanted no one to be left out! Your comments are so enjoyable and down to earth. I laughed out loud, over the comment you made about the valentine from the boy you had a crush on. I can so relate to that !!! 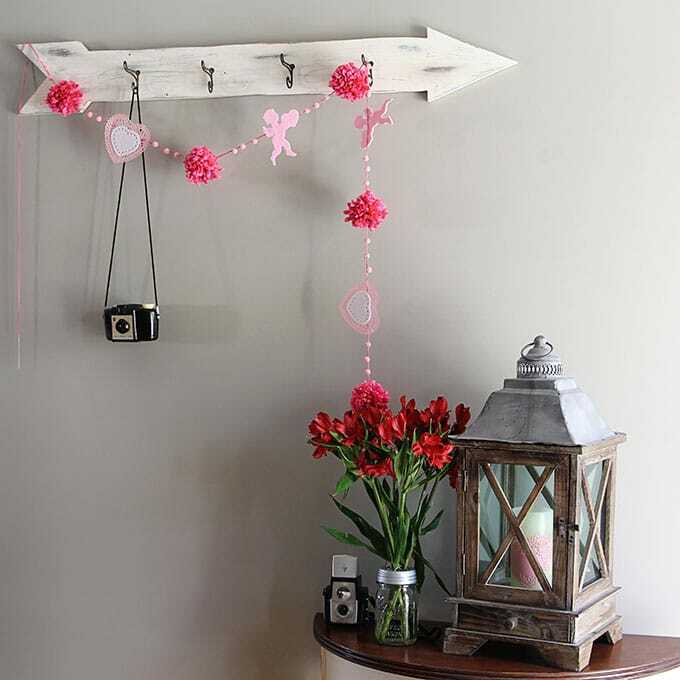 Quick + Easy = My type of craft! He hee! May it’s a poison dart for the boy who didn’t give you the Valentine message you hoped for! 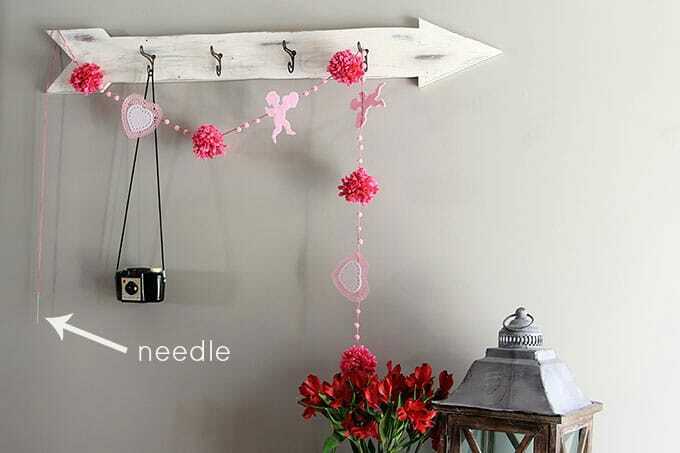 Your garland is adorable, needle and all. Thank you for transporting us right back to elementary school! 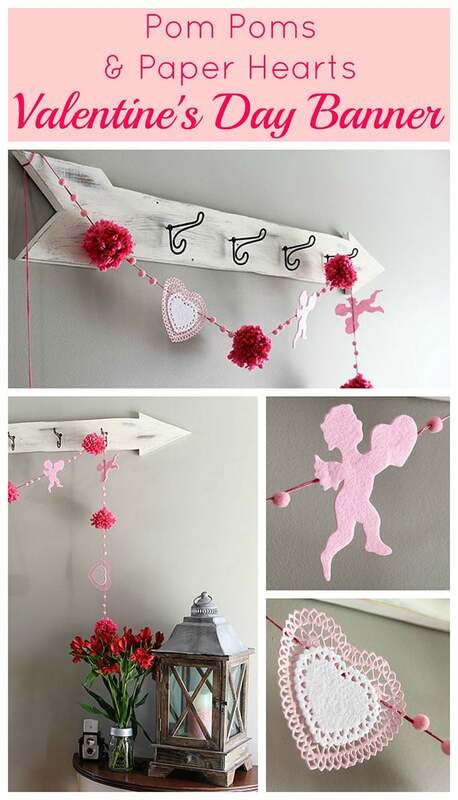 Such wonderful Valentine’s Day memories and you captured the essence of it all with your garland! Thanks for sharing. 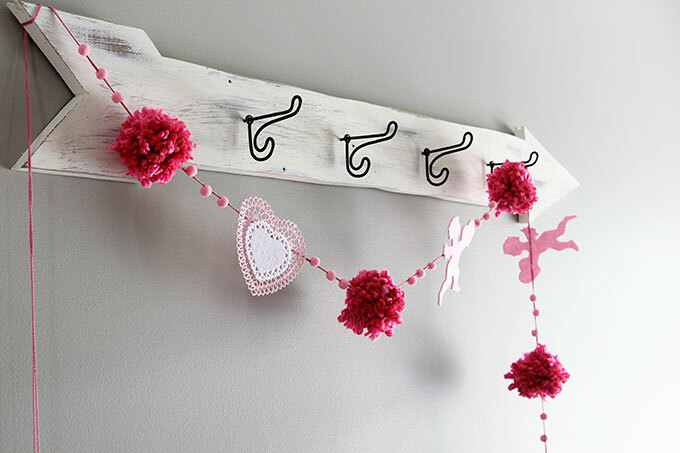 Love this garland and it’s whimsical look! 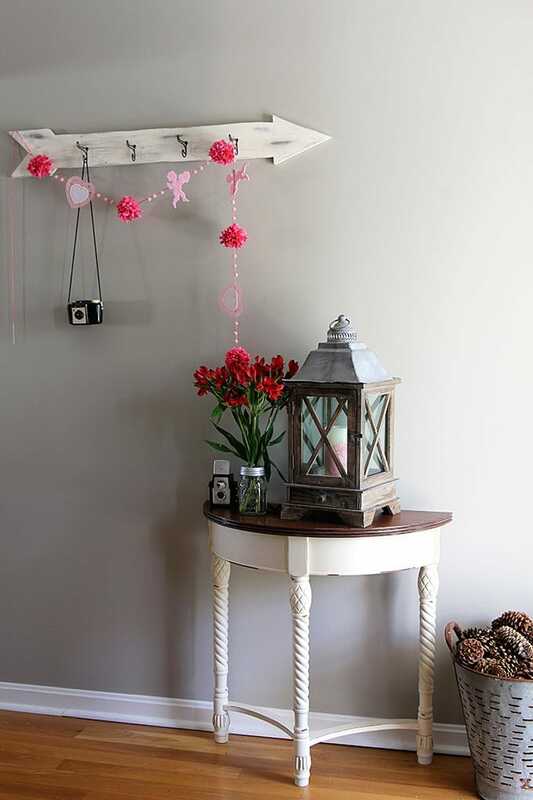 Why do I forget about pom-poms and trims…they are so cute! And I love your memories of grade school, it was such a fun time…I have a Valentine box story I want to share on my blog, too.